Thanks for the updated review. It's a pretty case and has me thinking "what if's" for gaming. The one thing I really like about the rotated mobo is the downward facing gfx card won't bow. Found one typo on the last page, 3rd paragraph under Final Thoughts. "is inconvenient, and it has only two spOureeds;"
When comparing the tables from the original review to this one I can see the new fans are really loud. Or am I wrong? Thankfully, for SPCR's crowd, they have other 180mm fans for sale that start at just 500rpm. They're expensive though. It would be interesting to see to what extend the vertical airflow affects temperature. Out of pure curiousness; could you test the case standing on its front so that the airflow becomes horizontal? Maybe it's just me. But I think cases this size no longer make so much sense. But £168 at scan.co.uk, which for a premium case with superb cooling and acoustics is pretty reasonable; the Cosmos II Ultra is >£300 and my current case actually works pretty well considering and it's kind of similar high quality, understated silver aluminium. And heavily personalised / modified to make it breath in a way it originally could only dream of, but it's still limited to CPU coolers<140mm tall and I can't overcome that. If someone gave me a FT02 (preferable on silver w/out window, but I'm not fussy!) I'd be extatic, until then I'll make do! For the air flow the bottom to top that "works with convection" is negligible, convection has no practical effect once you have forced air cooling, even if you put it upside-down for top to bottom I doubt it would make any measurable differance. What will have an effect is heat-pipe orientation, especially in video cards. Yes good heat-pipes have wicks in them but they are affected if in completely adverse orientation. Coolers where the pipes run straight the length of the card can be significantly affected by being vertical not horizontal. Examples include Arctic cooling Accelero Xtreme and Thermalright T-Rad, I believe where the heatpipe is in a U with the bottom of the U along the length of the card, like my Twin Turbo II and many stock coolers are not so badly affected. I did one time find an article where some one had tested the orientation on video cards and in some cases the difference was small and in others, possible the Accelero Xtreme it was large, like °20C large! Tell that to the gamers who continue to buy multiple graphics cards and kilowatt PSUs. Different folks, strokes.... and applications. How many people install dual video cards. It's nice to talk about this... but with the behemoths coming out currently, it seems like that money is better spent on a larger monitor that makes better use of the video than on a video card that already over muscles any but the largest screens. Agreed: There's no question that "serious" gamers willing to spend big bucks on computer hardware represent a very small percentage of total PC buyers & users -- and this case is geared mostly to that market segment. About the only other market segment I can think of for it is a custom high end PC or home/server server for geeks or folks who like nice things, and my bet is that segment is pretty stagnant. Remember that PC cases in the retail channels are geared to DIYers. Most people don't build their own PCs. Among those who do, serious gamers number highly. I assure you, there are many more gamers building computers than people who want a quiet, functional computer. The business model for small, well-designed, subtle, cases that are not for gamers just isn't that strong... otherwise you'd see more of them. The link to the Antec P280 on the first page is broken (it has a hyphen, antec-p280, instead of the underscore it should have, antec_p280). Apparently the DPI gating is Windows and that is going to be fixed in Windows 8 which will be able to handle up to 256 DPI. At least that is what I have read. I would have thought the vertical orientation of the graphics cards and venting their heat upwards would have shown a greater benefit. Seems like incremental improvements for a very expensive case. Mine does double duty as a ceiling fan. I have this case water cooled with the drop in 3x180mm radiator. It cools two 480s with the 180mm fans running at 600rpm and the MCP35X pump at 30%. Those cards are a lot more efficient at 55c and .988v than the some of the high vid review samples were at 1.088v and 92c loads. It has a pleasant gentle tone, but I miss my previous setup with a pump in another room and the radiator being 400' of deeply buried pipe. I'm never going to have a better silent gaming rig than that, even if it was cheating. I've had one of these since it was first released, and I have no complaints whatsoever. My old P180, the door hinges lasted about a month before breaking; this has stood up to a couple of years as a combination PC/footrest. I have the intake fans on the stock low setting and a Noctua D14 cooler with only the 14cm fan attached with the other Noctua fan from the cooler replacing Silverstone's top 120mm fan. In the box I have a Xeon W3520 (Same as Core i7 920), 12Gb of ECC ram, two Radeon 5700's, two 2Gb HDDs and a 146Gb SSD. It's by no means silent, but it is quieter than the P180 was. What I believe might be interesting is the use of water cooling with this case. 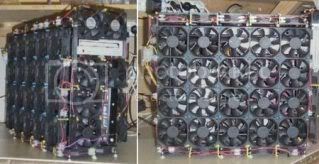 Some people use huge radiators (3x180) on the bottom fans to cool their cpu and gpu. Warm air is injected in the case but I believe the exhaust fan on top of the case can take care of it. Beside, the hottest components are still cooled by fresh air. Would the noise of a pump and reservoir be quieter then silent coolers on the cpu and gpu? Because if it is, this case might be the one I am looking for to build a silent high end (gaming) PC. I would really love to have a quite i7-3820 with a Radeon 7850. I believe this website has the best reviews concerning noise production of PC's. Gathering accurate data on the matter seems quite difficult. Unfortunately I haven't found any good website which investigates the noise production of water cooled systems. Could anyone recommend a website which deals with the noise production of water cooled systems? Also, I read the temperatures of the tests have been adapted to be able to compare the results. Can this be done accurately? I'm just guessing but doesn't the same principle apply to air? If the ambient temperature of a test is 2°C lower then the temperature of a second test, is it correct to adapt all temperatures of the second test by 2°C to compare the results? I really hope to get some answers on my questions. 1. Would the noise of a pump and reservoir be quieter then silent coolers on the cpu and gpu? No. Total heat/power really has to be ultra high before air cooling loses to WC on noise... and with cooling, it's pretty close up to that point. 2. Could anyone recommend a website which deals with the noise production of water cooled systems? Doesn't exist, afaik. We started to look at it many years ago but quickly realized there's really no point, it is such a limited niche. That's the accepted practice, which is reasonable, though I am sure you can find folks to dispute it. Actually it will be at 75°C, discounting the heat gained or lost from the container. If you put the warm water into the boiling water, then it will be a little hotter than 75°C due to the heat from the boiling water's container. If you put the boiling water into the warm water, then it will be somewhat cooler than 75°C due to having to heat up the container. If you had a third container prepared that was at 75°C already, or if the thermal mass of the container is small compared to water, then the mixture would be at 75°C. Ok, taking into account thermal expansion, it works out to be 74.6 degrees. Are you taking in to account the specific heat capacity of water changes with temperature? According to this table it increase from 4.182 at 50°C to 4.219 at 100°C. As this is only 0.9% it makes no practical differance to a water cooled computer though! I think the only time water is better for quiet cooling than air is if you want multiple video cards, or "quad" GPUs using a pair of twin GPU cards. This is simply due to the problems of getting enough heat-pipes and heatsinks in to the restricted area, water cooling blocks are small, single slot even, and then the heat is moved as far away as you like to the radiator(s) where space isn't an issue. The same may apply to monster dual CPU systems or very heavily over-clocked multi-core (6+) CPUs where todays heatsinks aren't big enough! Say - I see that the new version has upgraded to a USB 3.0 slot in front. In the Q&A section of the FT02 product page there are instructions on how to upgrade to USB 3.0 front connections, so obviously it can be done. The part number to look for is G11303260, but I do not find this spare part on their site. Just thought I'd chime in with one problem I had with the FT02 that I have not heard others talk about. I tried out a couple higher power PSU's that admittedly may be too powerful for this case, the Corsair AX1200 and the Seasonic X-1050. When in the FT02, they ran very loud, with the PSU fan running at a very high speed, even when they were using well-under 200W. I suspect this problem was due to the vertical orientation of the PSU. This position may make some PSU's think they are running much hotter than they are actually running. Perhaps this vertical position directs a lot of heat at sensors in some power supplies. Maybe I'm overlooking something, I dunno. If those of you at SPCR feel like checking this yourselves, I welcome you to do so. Currently I use a Corsair AX850 in my FT02 without this problem. I upgraded the front panel USB on my FT02. It's a simple job, at just a question of four screws and some cable routing. Silverstone can sell you the part if you email them, and some online retailers carry them. Also - the "drop in" 3x180mm radiator for the FT02 helps make a ridiculously quiet gaming rig. My buddy has one with 2x GTX 580s in SLI and an i7 2600k clocked at 5.0 GHz - and it can run with the 180mms at lower rpm than the default "LOW" setting and still not go much beyond 60 C under full load.... Compare to my air-cooled FT02 where the stock 7970 cooler screams under load. If I remember correctly, the AP 181s run around 700 rpms at their "LOW" setting. I find them fairly noisy at that level, but just a slight reduction in speed (say 600-650) takes off a lot of the noise.